Roosevelt Campobello International Park preserves the house and surrounding landscape of the summer retreat of Franklin D. Roosevelt, Eleanor Roosevelt and their family. 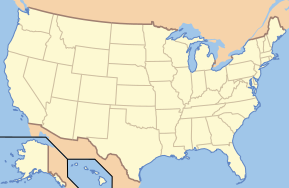 It is located on the southern tip of Campobello Island in the Canadian province of New Brunswick, and is connected to the mainland by the Roosevelt Memorial Bridge, at Lubec, Maine in the United States. Here in August 1921, 39-year-old Roosevelt, who would go on to become the 32nd President of the United States, fell ill and was diagnosed with polio. :236 FDR was no longer able to stay at the "beloved island", but he sailed there in 1933 and visited briefly in 1936 and 1939. Eleanor Roosevelt loved the cool summer weather and visited many times with her children and friends. After her death in 1962, the family deeded the property to the governments of the U.S. and Canada. In 1964, they created the 2,800-acre (11 km2) International Park. The cottage, built in the Shingle Style and completed in 1897, was designed by Willard T. Sears. Roosevelt Campobello International Park has a visitor centre with a gift shop and a small bilingual display on the open Canada–United States border. The park is owned and administered by the Roosevelt Campobello International Park Commission, created by international treaty signed by Governor General Georges Vanier, Prime Minister Lester B. Pearson, and President Lyndon B. Johnson on January 22, 1964. The park was established on July 7, 1964. Both countries provide financial support to the park. It is an affiliated area of Parks Canada and of the U.S. National Park Service. Charter members of the board of the international commission included U.S. Senator Edmund S. Muskie, Franklin Delano Roosevelt, Jr., and Lubec, Maine, resident Sumner T. Pike. ^ "F. D. Roosevelt Ill of Poliomyelitis". The New York Times. September 16, 1921. Retrieved 2015-09-24. ^ Ward, Geoffrey C.; Burns, Ken (2014). The Roosevelts: An Intimate History. New York: Alfred A. Knopf. ISBN 9780307700230. ^ Roosevelt, Eleanor (August 10, 1962). "My Day". The Eleanor Roosevelt Papers Project. Department of History, The George Washington University. Retrieved 2015-09-26. ^ "FDR and Campobello". Roosevelt Campobello International Park. Retrieved 2015-09-27. ^ "Chapter 1: Eastern Maine". United Divide: A Linear Portrait of the USA/Canada Border. The Center for Land Use Interpretation. Winter 2015. ^ Two articles by Donald R. Larrabee, one each from Bangor Daily News and Maine Sunday Telegram, entered in Congressional Record – Senate, June 10, 1975, page 18115, by Sen. Edmund Muskie, in Bates College Muskie archives. The National Parks: Index 2001-2003. Washington: U.S. Department of the Interior. 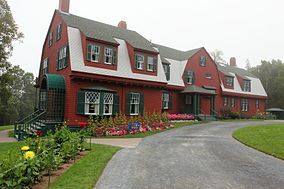 Wikimedia Commons has media related to Roosevelt Campobello International Park. Wikimedia Commons has media related to Franklin D. Roosevelt on Campobello Island. This page was last edited on 12 February 2019, at 02:10 (UTC).